The Jimmies by PLUCKYPEA INC.
Other products from PLUCKYPEA INC. This much-anticipated first album from New York City’s favorite kindie rockers, "The Jimmies," has already met with wide acclaim and plenty of toe tapping, with music running the gamut from rock, funk, pop and blues to reggae, hip-hop and even Dixieland. The group's clever lyrics, catchy hooks and sophisticated melodies add up to an album full of songs listeners won’t mind getting stuck in their heads. Launch date: April 22, 2007. The collection of thirteen original songs covers all the seasons of the year. The record also encourages families to find what’s special in every day, whether it be a birthday, a holiday or a Wednesday. “The album is real music for kids who are too old for toddler tunes, but not quite ready for main stream pop music,” Rebecca Frezza, of Big Truck Music LLC, told TDmonthly. Launch date: April 8, 2008. Featuring acoustic arrangements, R&B influence and optimistic tunes that bring back the feel of the ‘70s, this 12-track album includes the songs “Road Trip,” “Your Smile” and “Good Night, Daisy.” Launch date: March 4, 2008. 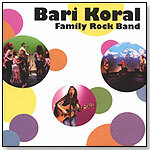 Singer-songwriter Bari Koral joins New York City musicians to produce a record that both kids and parents will enjoy. The three-piece rock band combines pop songs with kid-friendly lyrics, in tracks such as “The Farm Song,” and “Dad’s New Car.” At the same time, songs such as "A Day at the Beach" (reminiscent of the Go Go's) and "Dance all Day," (which draws from both Blondie and “The Hokey Pokey”) are sure to delight parents as well as kids. "Parents inevitably find themselves playing and singing the music, even when their kids are not around," Stephanie Rothschild of Charles E. Rothschild Productions told TDmonthly. 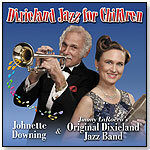 Multi-award-winning New Orleans singer/songwriter and children’s musician Johnette Downing, staying true to her Louisiana roots, joins forces with Jimmy LaRocca and the Original Dixieland Jazz Band on "Dixieland Jazz for Children." The recording gives Johnette the opportunity to share with children all over the world music that provided the soundscape for her own childhood. "Johnette Downing brings the spicy flavors of her home state to all her recordings," Elizabeth Waldman Frazier of Waldmania PR told TDmonthly. "It was Johnette’s idea to update Dixieland jazz, fusing it with her own lyrics and new melodies." Launch date: May 6, 2008. This 15-track, third album from artist Thaddeus Rex salutes the Windy City and brings in the vocals of Grammy award-winning Koko Taylor, the piano talent of long-time bluesman Pinetop Perkins, and writing by Alan Gershwin. 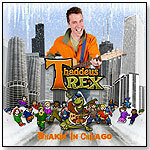 Tracks include “Running in the Sun Again,” “Midway Fair” and “I Still Love Cookies.” “Thaddeus Rex not only encourages kids to sing along, but asks them to write, too. His writing contest has helped two elementary schoolchildren become professional songwriters, and he’s looking for more!” Elizabeth Waldman Frazier of Waldmania! PR told TDmonthly. Launch date: April 1, 2008. This album is Abby's third rockin' release and winner of an iParenting Media Award. Featuring a wide array of genres and instrumentation, including pop, rock, funk, country, rockabilly and calypso, it offers 45 minutes of fun, danceable tunes that will have the whole family on their feet. Interactive songs spotlighting four-part harmonies engage kids and get them moving. As a bonus, the CD is made from eco-friendly packaging with recycled cardboard, veggie inks and recycled water bottles. The CD features "educational and encouraging themes written into catchy tunes that are great fun for kids and parents alike," Michele Senitzer, owner and creator of Pipsqueak Productions, told TDmonthly. Launch date: February 11, 2009. 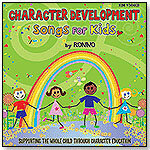 This CD by RONNO will encourage children to grow as individuals, learners and responsible citizens. The song lyrics focus on timely and important topics, such as bullying, respect, responsibility, compassion, conflict resolution, self-esteem and more. Positive songs support solid character building, and the music is lively and fun. An extensive guide is included. Launch date: March 2009. Put on your western hats and boots for this toe-tappin’, knee-slappin’, sing-a-along collection of dancin' songs, perfect for any shindig. A delightful mix of original and traditional songs that overflow with country charm, whimsical humor and hootenanny, merry-time fun! Kick up your country heels with lively dances including, "Scootin’ Dance Boogie", "Knees Up Mother Brown" and "Cadence Square Dance". Rejoice in unforgettable, heartwarming renditions of "You Are My Sunshine" and "Happy Trails to You". Explore our beautiful nation with a song that rhymes all 50 states, patriotic favorites and cherished classics like, "Froggy Went a Courtin’", "My Aunt Came Back" and "I Love My Rooster". This is a country assortment of 18 tunes that is certain to become a treasured favorite. The CD comes with a 24-page booklet with lyrics and dance movements. New MATHeMANIAC Maya joins the Crazy 4 Math Club and finds out that she can combine music and her favorite sport, rope jumping to get back on her math track. The Googols' powers help turn this math club into a real "partay"! MATHeMANIAC includes skip counting forwards and backwards from 2-13 and from 25. Learn about big numbers as you skip count from 1000 to a million and on to a googol! Practice doubling past a million. Listeners of all ages will develop mental math skills to help addition, subtraction, multiplication and division while gaining an appreciation for different music genres. This album features fun children's music that encourages creative movement and embraces, enriches, and extends early learning through songs that are age- and developmentally appropriate, as well as relevant to themes in a child's world. As a former prekindergarten teacher, Brian has long been an advocate of the philosophy known as emergent curriculum — a system of creating lesson plans that are based on student’s passions and interests. It was through this process, including arrangement tips and lyrical ideas from children, that each song was crafted. The CD won the 2008 Children's Music Web Award for Best New Artist for Preschoolers Ages 0-5. Launch date: June 2008. From the award-winning Banana Slug String Band come 10 toe-tappin’ tunes that celebrate all things water. 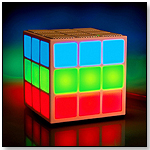 Each song makes a perfect introduction to an elementary science lesson or just some danceable fun. Kids can grab their waders and wander from spring to sea in a musical adventure that’s wet and wild. Launch date: March 6, 2008. This adventure of good, old-fashioned fun features an upbeat collection of songs by Michael Plunkett that moves children from high-energy action to quiet-time. The songs are easy-to-sing and memorable, and offer valuable early learning opportunities, as well as activities that encourage creative movement and imaginative play. There’s also attention to building relationships, eating healthy foods, hygiene, manners and more. 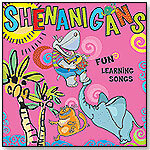 Shenanigans is great for the family to share, as well as a special resource for schools and libraries. "It offers a music style and lyrics that today's kids can relate to, and adults will also enjoy," Elaine Murphy, director of sales and marketing for Kimbo Educational, told TDmonthly. Launch date: September 2008. 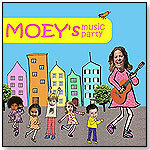 "Moey’s Music Party" is a 17-song CD with fun songs that entertain and educate children — and get parents dancing, too. The songs are about manners, sharing, listening to parents, getting dressed, tasting sushi, and being a kid in New York City. They were inspired by award-winning, Off-Broadway songwriter Melissa Levis's (aka Moey’s) own experiences as a mother. “I Gotta Go Potty” was her son’s potty training mantra, and “Pierre Wouldn’t Wash His Hair” was her solution to his six-month hair-washing strike. The CD is a winner of Dr. Toy's Best Vacation Product 2008. Launch date: June 2008. Thirty-seven easy-to-say singable chants and songs from around the world. Traditional and original. Interesting sound effects, games and clapping, field holler, warm-ups, welcomes, fingerplays, chain gang, sea chantey, celebration, dance, language arts and more. Created by Rob and Lisi Wolf, this 14-track, 42-minute album features acoustic version of songs by Neil Diamond, Fleetwood Mac, The Beatles and others. The product is made in the United States, using recyclable materials. This energetic album, featuring vocalist and guitarist Matthew Pryor, drummer Bill Belzer, guitarist Dustin Kinsey and bassist Eric McCann, is full of "playground pop" songs that were inspired by Pryor's kids. The family-friendly, 16-track CD includes homegrown themes set to upbeat rhythms and cool melodies. This soothing collection features performers Marco Calliari, Bia, Lynda Thalie, Idrissa Zal Sissokho, Penny Lang, Luc Lopez, Muna Mingole and members of the Canadian folk-pop group Hart-Rouge. The lullabies come from Brazil, Belgium, Senegal, Israel, Algeria, Germany, Canada and other diverse places. The warm lead vocals and harmonies on each track are supported by musicians playing on more than 30 different instruments. The earth-toned, dreamlike illustrations of the picture book edition and CD packaging reflect both the subject and country of origin of each song. Run time is approximately 40 minutes. Each CD includes printable files with lyrics and illustrations. A colorful, 36-page hardcover picture book with a CD is available separately at an MSRP of $22.95. Launch date: October 21, 2008. This 2007 Parents' Choice Approved Award winner offers a creative variety of music for children of all ages. The family-friendly audio CD features songs that promote tolerance and caring for the earth and its creatures, while spotlighting fun kids' favorites and soothing lullabies. "Love Makes a Family" is an original song about adoption. And "What Should I Dream About?" gives listeners a chance to identify the word painting provided. "Parents love this CD as much as children do!" Denise Mitkus, a member of the Peanut Butter Jellyfish band, told TDmonthly. "It's entertaining for the whole family and [is] a refreshing change from silly songs." Launch date: December 1, 2007. 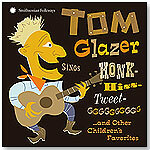 "Tom Glazer Sings Honk-Hiss-Tweet-GGGGGGGG and Other Favorites" is a delightful collection of children's music recorded live from the 1950s to the 1970s. Among the 24 remastered songs are irresistible favorites like "Skip to My Lou," "This Old Man," and "Hush Little Baby," as well as original songs composed by Glazer and unique renditions of folk classics from around the world. With intimate liner notes by John, Peter and Diana Wasserman Glazer, including lyrics to the songs, "Tom Glazer Sings Honk-Hiss-Tweet-GGGGGGGG and Other Favorites" introduces Glazer's legacy to the children of the twenty-first century. Launch date: October 28, 2008. 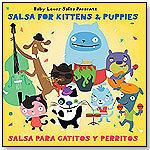 Baby Loves Music is proud to announce the release of "Baby Loves Salsa", a CD and colorful book featuring real salsa music by amazing artists under the direction of band leader and singer Jose Condé and produced by Grammy Award winning producer Aaron Levinson of the Spanish Harlem Orchestra. Baby Loves Salsa family concerts have already taken place this year at Central Park, Miami’s Bicentennial Park and San Francisco ’s Golden Gate Park. The new book and CD feature a fanciful menagerie of characters – “Lalo el Largo," “Chico Chocolate,” “Arsenio Ruff Ruff” and “Celia La Cruz,” among other cleverly drawn Baby Loves Salsa band members, whose voices are actually those of acclaimed musicians and vocalists from various Caribbean countries. From the first track, “Somos la Banda,” to the danceable tunes “Vamos a la Playa” (Let’s Go to the Beach”) and “Mi Familia es la Musica” (“Music is My Family”), the songs will engage everyone in the family with their irresistible melodies and rhythms. Launch date: September 30, 2008. This album, dubbed a "14-track ode to childhood wonder," blends bluegrass, classical symphonic sounds and Indie charm. In addition to providing the primary vocals, artist Danielle Sansone plays piano and acoustic guitar for this collection of love songs that includes "Bed of Roses," "Whisper" and "There is You." Launch date: 2008.